What a refreshing way to make bruschetta, and colorful, beautiful. Note to you — I have “made” fettunta (put some toasted pignoli nuts on top) and so, so good when the bread is really good. I love bruschetta but never thought to use fruit. I have to try this before melon season is over! Sweet Bruschetta, sounds wonderful with the cheese – yum. This looks tasty and sweet! Very unique! Beautiful photo too. Once again, you have reminded me that Italian cooking, especially Tuscan, holds a special place in my heart. One of life’s finest treats a slice of bread with olive oil and garlic! Wow, this sounds delicious. I love the idea of melon in place of tomatoes. Ah, summer is here. What a refreshing (and lovely looking) way to make bruschetta. 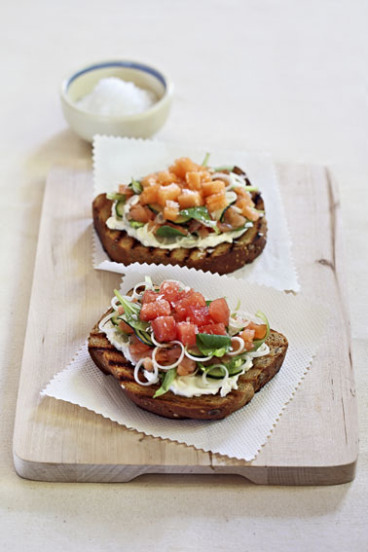 What a beautiful, refreshing take on bruschetta!! This sounds delicious. I love the combination of watermelon and feta. Perfect for summer! This is the perfect summer food. Simple, colorful and seasonal. What a beautiful recipe!